Former Florida governor Jeb Bush is “moving forward” on a potential 2016 White House run and it appears more likely he will enter the Republican field, according to his son, who is himself running for office in Texas. George P Bush, who is running for Texas land commissioner, told ABC on Sunday his father was “still assessing” a presidential bid, but suggested it was more likely that he would seek the White House this time. The ex-governor declined to run for president in 2012, despite encouragement from Republicans. “I think it’s more than likely that he’s giving this a serious thought and moving …and moving forward,” said the younger Bush. Jeb Bush, the brother of former President George W Bush and the son of former President George HW Bush, would stand out in what could be a crowded Republican field in 2016. He has headlined fundraisers for Republican candidates and committees and helped campaigns for governor in Iowa, South Carolina and Nevada, three of the first four states to hold presidential primaries. Family considerations could play a factor in his decision. In an interview with the Associated Press this month, Jeb Bush said his wife, Columba, was “supportive” of a potential presidential campaign and his mother, former first lady Barbara Bush, was now “neutral, trending in a different direction”. Barbara Bush declared last year there had been “enough Bushes” in the White House. 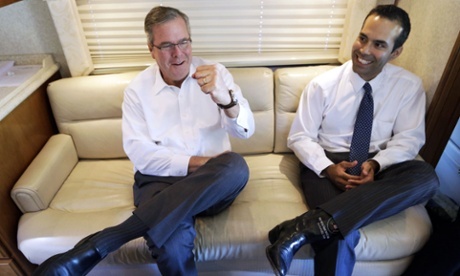 George P Bush said his family would be “100%” behind his father if he decides to run.